Nevertheless, calculation of absolute flow values in nuclear medicine techniques can be affected by patient-depending factors and technical issues, pitfalls, and artifacts.7 Among the most frequent artifacts is myocardial upward creep that was first described in myocardial single-photon emission computed tomography after physical exercise.8 In PET imaging, usually during vasodilator stress imaging, a reposition of the patient’s heart is observed due to alteration on the diaphragm–heart position, also potentially owing to the increase in lung volume with deeper and faster inspiration and expiration. The most essential consequence of this is that the misalignment of myocardial contours, primarily in the inferior and inferioseptal region, leading to false altered myocardial flow values, hampering the diagnostic accuracy of the test.9 Misalignment between PET and computer tomography (CT) attenuation images (AC) can also lead to biased MBF values.10 Myocardial creep could be in theory attributed on one hand on the misalignment of PET-CT AC and on the other hand on the myocardial contour position at the post-processing phase. In the current issue of the Journal of Nuclear Cardiology, van Dijk et al. 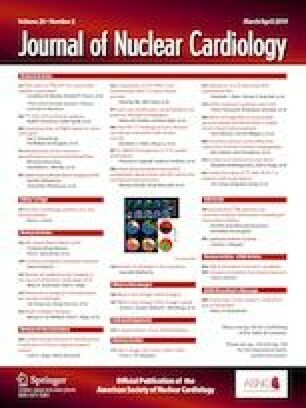 investigated the effect of framewise AC instead of single PET-CT AC on MBF in patients with myocardial creep.11 The authors retrospectively identified 31 patients (out of 64 consecutive patients) who underwent myocardial perfusion imaging using 82Rb-PET-CT, and in which myocardial creep was observed during regadenoson stress. The latter was defined as a misalignment of at least one-third of the width of the left ventricular myocardial contour in at least two frames. For the stress scans, two different approaches of co-registration with the CT images were tested prior to the reconstruction of the dynamic dataset with the CT-based AC. More specifically, a conventional late-time PET data alignment with the CT images and a semi-automated framewise attenuation correction approach for the early-time frames were investigated. The authors demonstrated a lower than 10% relative difference on the MBF between the two methods and there was no statistically significant difference on the total- and arterial territorial-specific MBF measurements between the two methods. Furthermore, the difference in MBF between the two reconstruction methods did not correlate with the shifting difference between the CT and PET images. Misregistration between CT attenuation and emission PET images can be a common source of artifacts. In two hundred and fifty-nine consecutive patients who underwent 82Rb-PET, a misregistration of the myocardium of less than 6 mm was shown to result in less artifacts; a concept that was later also demonstrated for MBF quantification.10,12 In a simulation study with 82Rb- myocardial perfusion PET, a misregistration of 10 mm resulted in an overestimation of global MBF up to 9%. While in the latter study misregistration was present during the whole acquisition time, the fundamental difference is the temporal component as in the current real-life study by van Dijk et al., misregistration was observed in just about 25% of the frames (4.3 ± 1.1). Notably, although the 10% relative difference on the MBF was not shown to be significant, the sample size of the study is certainly small to assess the clinical relevance of the findings. Nevertheless, these results derived from real patient data could potentially be extrapolated into the general population, scanned with the specific protocol, PET-CT scanners, and vasodilators. Certainly, more clinical studies are warranted to confirm this assumption and to generalize the findings to other tracers and stress agents. The authors deserve plenty of credit for addressing this essential technical issue on 82Rb-PET-derived MBF calculation, adding one more step towards perfecting MBF measurements. From our experience, although myocardial creep is commonly present in stress datasets, in a small number of patients it could also be seen during rest imaging; recognition and correction are needed in both stress and rest scans and for all pharmacological vasodilators. The less prone to artifact PET myocardial perfusion imaging is, the more accurate shall the results be, allowing us to better assess quantitatively the hemodynamics of coronary lesions and subsequently to enhance our understanding of the underlying pathophysiological mechanisms. Cardiovascular imagers should be aware and notice myocardial creep and software vendors must allow control to the operators in each processing and post-processing step that could influence the calculations of physiological parameters. It is of prime importance to work with accurate numbers that can be translated into clinical meaningful reports. The University Hospital Zurich holds a research contract with GE Healthcare.